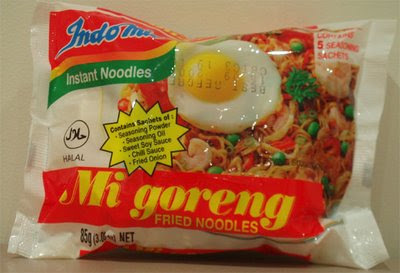 The MacDaddy of noodles.. once you've tried a bowl of these dry noodles with their magic sauce, preferably with a fried egg on top and a couple of chopped frankfurter sausages, maybe some fried onion sprinkles on top, you will never go back, your life will take on a new wonderful edge. Available in one place in Gerrard Street in Chinatown (north side in the middle, up a small flight of steps), these are the best a noodle can get. Useful fact: Mee Goreng means Noodles (Mee) Fried (Goreng) in Malaysia, it's what you have from the Mamak street stalls with an iced milo. Another glorious noodle, this one soup-based, spicy and sour, Asam Laksa means curried fish, though you wouldn't guess it from the taste. Nevertheless it is a marvellous sharp infusion of delicious flavour, and I commend it to you! The secret with this one is to drop in and mix and egg towards the end of cooking, also to vary the quantity of soup depending on how you're feeling! I actually settled on a box of this when I couldn't find any Maggi Mee (what has happened to the Maggi, there's definitely some sort of global conspiracy going on). 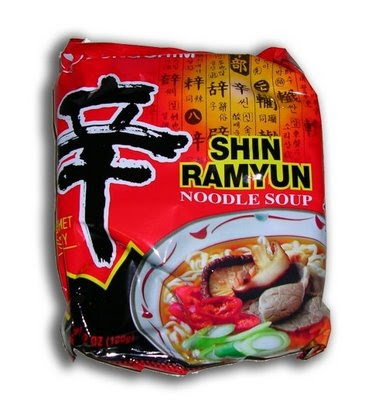 Anyway, I was fortunate in my choice, and discovered another wonderful instant noodle, this one having a lovely spicy creaminess, and if you have any tahini in the fridge.. a dollop of that mixed in seems to work well, though makes the noodle bowl a bugger to clean afterwards! These are apparently Korea's most popular noodles, and whilst they're not part of my regular noodle investment portfolio, I am partial to an occasional one. Interestingly they come with a sachet of bits of dried vegetables which rehydrate to form a sprinkling of random coloured bits in the noodles! Try to identify what they're supposed to be for a fun game!